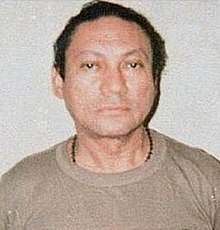 Manuel Antonio Noriega Moreno (Spaingie pronunciation: [maˈnwel noˈɾjega]; born Februar 11, 1934; died Mey 29, 2017) wis a umwhile Panamanian politeecian an militar officer. He wis militar dictator o Panama frae 1983 tae 1989, when he wis removed frae pouer during the invasion o Panama. ↑ Serrill, Michael S. (January 24, 2001). "Panama Noriega's Money Machine". Time. This page wis last eeditit on 30 Mey 2017, at 12:51.